This is the first part of series (hopefully) of Instructables where I will show how to upcycle things to the maximum. I'm going to start with something simple - a glass bottle. Probably many of us have tried making a glass from a wine bottle and threw out the left over part of the bottle. I was doing that for a long time as well, but as of recently I'm not throwing out the top of the bottles any more because they make a great lampshade. Since this is the first part of series and I'm planning to enter the "Teach it" contest with this, there will be more explanation of various processes included in all of this. I myself am currently doing the cutting and polishing with a tile cutter, Dremel and an improvised flat lap (for which I will sometime make and 'ible as well) which gives a way smoother and more predictable outcome, but I know the frustration of not being able to make something due to lack of fancy stationary tools since the only one I have is this small tile cutter. That's why I have decided to make this instructable as simple as possible and within the reach of many. To cut a bottle, you have to find one first. If you're drinking the wine to get the bottle empty, for your own safety delay cutting it until you're sober. Sharp edges and blades doesn't mix well with intoxication. Then you need to remove the labels and to do so effectively you need to determine how is it glued on. Tip: Scratch up the corner of the label - if it's dry - the glue will come off with water, if it's gooey - the glue will be acetone/alcohol soluble. Mine was dry so I sped up the process by scraping off the main part of the label, then went and washed the remainder off using a scrub and some dish washing liquid. If yours is gooey, use scraper to lift and peel off, then clean with acetone or put the bottle in the oven or hot water to heat the glue and it will come off way better, clean the remainder glue afterwards. Think about how tall you want your glass. I prefer them at around 10-11cm (4-4,3 inch) so that's where I marked dots around the bottle. Now take the bottle and find a position where you can rotate it steadily and try it out while marking a line around it, that way you get an idea of a position in which you can score a line around the bottle as straight as possible. Now that you know your position, score a line with a glass cutter. And then one more around the neck, if you're making a ring too. Wear glasses and gloves when scoring the line, since tiny shards tend to go in all directions while doing that. Fire up your butane torch or candle and warm up your bottle, then heat it up along the score line until it starts cracking (you might need a thin stream of water for that if using a candle). You should end up with something similar to the three parts seen in 9th picture of this step. Protective glasses is a must while heating, gloves come handy too. Tip: Heat and glass need some time to get along. When starting to heat the score line do several runs along it from further to warm it up a bit and not stress, the same goes for when you hear it starting to crack, don't take the heat away right away, to some runs from a bigger distance. Keep in mind, that this step involves a lot of possibility of failure and it's ok, it happens when you use heat to cut bottles. You can see that I failed while scoring (pic 4 of this step) then failed some more while heating it (pic 6) and I ended up cutting another bottle (pic 10) and I even managed to crack the ring from original bottle by overheating it with the grinding wheel. The failure rate is pretty high this way and even higher if you hurry the process a bit like I did. You can try fixing bad cracks off the line by scoring another line, but it's even more likely to crack somewhere wrongly once again. Now that you have your bottle cut it's time to grind and polish it. For your own safety wear glasses and a face mask. Even the rim out to the level you are comfortable with the silicon carbide grinding stone, you should end up with something like in picture 2 of this step. You want to grind enough so that the score line is not visible any more. I recommend going around the sharp edges first, so you don't accidentally cut yourself when grinding other spots. Polish the places you ground and you can skip the shiny part where it nicely cut in place. I use my polishing wheel at the speed of 25k RPM despite the recommended 15k - it gives a shinier finish and I haven't had a problem because of that once. You should end up with a finish similar to the one in picture 4. Look around surprised after hearing something similar to a grunt. Find out that your dog is watching you while enjoying himself. Laugh and continue happily. If you feel like it, take a sharp diamond tip and engrave something on your ring. I suggest you draw the design with a marker before actually engraving, unless you're really good with the dremel. Tip: There are several ways of getting rid of the bigger chunks of glass left above the line you intend to level off at besides grinding endlessly. You can use pliers to remove the bigger chunks. It's likely that they will break off at the score line. There's also a way of using heat. While I don't recommend going for the butane torch due to very high risk of breaking in the wrong direction you can generate very localised heat with the grinding wheel if you don't move it around and push down a bit. It's likely that the bigger chunk will crack at the score line from that and jump off. When you see glass melting around the grinding wheel, you'll know it's hot there. Wait a moment, you probably have to clean the glass from dust and connect some cables before that. Cleaning is no rocket science, while wiring this simple would not qualify as science either I guess. Take the cable and connect the two wires to the opposing sides of either a power plug or bulb socket, just don't forget to put the lampshade in between the socket and plug. Since it's probably evening by now you have a nice chance to turn on your new lamp, sit back, pour a beverage into your newly made glass, relax and grin with satisfaction while thinking about your newly gained skills. It's technically possible to do it all using a Dremel alone if using a diamond cutting disc for cutting the bottle. I don't however have one, nor do I think it would be a good idea on any other than very thin bottles because it would heat up too much or be too slow otherwise. I'm sure that many of us on Instructables have heads full of ideas. Anyway, I hope there will be at least a small piece in this write-up for you to take away and improve yourself. It's nothing revolutionary, but it's worth reminding yourself some things. You may have a question of who I am to tell something worthwhile about ideas and that's a valid question, since I don't have that much credibility apart from being trusted with custom reuse-including projects with enough trust in my ideas and execution to leave everything from design to production without checking up constantly until it's done. Ideas are about connecting the dots. The more you see around you, the more dots you are going to have available for connection. This means, that to get ideas, you have to feed yourself ideas. You can do that in many different ways, like travelling, interacting with different people or simply wandering on the internet, you will have to find how does your mind work best. Mine does that by connecting the dots I see on the internet, that's everything from how forms go together, to the working principles of something. That's where websites like Instructables, tumblr, Reddit, Recyclart, Etsy, TED become really useful. So find what works for you and do that. When you come up with something in your mind, write it down. Seriously. That's the only way you're going to keep it. Write it down! When it comes down to the realization of ideas, some of them may seem out of reach and some of them actually are, but most are not. Tools can be borrowed or rented, working place can be found or made and money can be raised in various ways, if that's the case. Look around, look what others are doing and how. This comes down to the same "to get ideas, you have to feed yourself ideas". If you want something enough, you will find a solution. Thanks for taking the time to read this, I hope it was useful. If it seems well suited for a contest - vote for it. Thank you! I have to be a kill-joy here and raise further safety issues. You've addressed shards and chips, but you haven't taken adequate precaution against glass dust. The face mask you've shown in the pictures is not fine enough to filter out the dust from polishing or engraving the glass. If glass dust gets into your lungs, it's there to stay and will lead to conditions similar to Asbestosis. I have a friend who engraves flat sheets of glass with a dental drill, and he works under water. Obviously, you can't cut the bottle underwater as it would be impractical, however, to flatten the cut surface, obtain another sheet of glass (minimum 1/4 inch thick) to put in the bottom of a tub/tray of water. This will give a flat surface (work-plate) on which you can place a piece of wet&dry abrasive. You place the piece of bottle on the abrasive and rub in a circular motion, until you have a clean cut. Attach a flexible shaft to the Dremel (for it's safety, and yours) so that you can polish the final cut and/or perform engraving all under the surface of the water. Yes, you can remove your piece from the water and dry it if you want to perform heat-smoothing. Just be cautious with your time so that you don't destroy your work of art with further heat-stress. The tub/tray needs a good fitting lid to prevent evaporation. If the tray dries out, the glass dust can become airborne which is exactly what you don't want. For longer term use, you will also need a preservative, just like a swimming pool. Salt the water to ocean strength and this will reduce the amount of chlorine you need to use. Remember, if you can smell the chlorine, you still need more! When ready to empty the tray, grab a fluffy towel that is folded to at least four layers. Concentrate your waste in the center, and rinse the tray thoroughly, always into the center of the towel. Once you are satisfied that you've flushed all the glass dust from the tray and your work-plate, roll up the towel tightly, seal it in a plastic bag while still wet, and send it straight to land fill or incineration. A further downside to all of this is that glass is actually more fragile under water. I don't understand why either! Therefore you will have to develop a new gentler approach to your work. Sorry for the lecture but, I don't like the idea of people unknowingly putting themselves at risk in what should be a rewarding recreational activity. Not laughing at you, laughing at the world lol. We have became such a weak freaking society, everyone wants to be politically correct or change the law to protect everyone. You know that song about drinking water from a hose ect. My Grandpa was in construction his father and his father, never did they use safety equipment. I have been cutting glass for 20 years and never have I worn anything but gloves and the glasses I have on that are rated safety. I put a towel down if I use a bottle cutter, I dump the shards in the trash and I wash the dang towel. Why would I incenerate anything. I don't mind safety but man we take things way too far in the freaking world now. There is a reason people only live to be 77 and its so we have room for new one's coming in, we all can't live forever, so live a little. I don't think you're laughing at me. Shards are unlikely to be inhaled. Glass dust is an entirely different matter. I agree that in general, particularly when everyone wants to sue someone else for their own stupidity, some things have gone way too far. I'm not out to make it "illegal" for someone to polish or engrave glass in the open air, just to make sure they are informed of the hazards. Having been attached to the electrical industry for the majority of my life, and knowing people who have been electrocuted (despite safety measures), I can only emphasise safety, not enforce it. As an agile child, I used to dart all over construction sites, stepping from beam to beam, without any concern about dropping through the floor. As a teenager, that fine sense of balance was upset, and I fell through the roof I was helping my father construct. If properly informed, and people still choose the risky behavior, it should be on the own heads, not blamed on someone else. Hi! I appreciate your input on this and will probably edit the Instructable to address some of them. I've no objection to your sharing this safety information with others. I admit, I did not follow your link to see that you had posted other safety information. Another way to cut the bottle is with a string and a flammable liquid. Drench the string in the liquid (for example aceton) and set it on fire. Then when it's nearly burned out drop in a cold bucket of water. You'll have a nice cut near the string. Check out youtube for videos. The string method only works on thin glass bottles and produces by far the roughest and jagged cut. So I'd say you can do that with beer bottles and thin wine ones, not much more. I took your advise and checked out a couple of videos. How cool! Never would have thought of that. Thank you! Thank you for this. I make quite a few lamps and string lights from bottles and use them for glasses also but didn't even think about the rings. Just a tip, but for me using a soldering iron around the score line works much better than a torch. Remember everyone has a different touch, so what works for one might not work for the other, but I seem to cut down on my failure rate by doing it with an iron. Solder iron sounds good and might actually be something you can control better than flame, thanks for the tip! where is your glass cutter? what does it look like ? why hide the machine with your glove ? cutting wheel -- or is it a std glass scoring tool ? You raised some valid points here, thanks! Glass cutter(scorer) is the 3rd tool from the top in step 1, pic 1. Looks like this. The glove is there to protect my hand from small glass shards resulting from scoring and is barely visible from any angle in this case. The pressure should be enough to make a score line, don't score twice over the same line though. A perfect cylinder will probably not be the case if doing this as simple as presented, however you can get close to that by making a simple jig. Scroll down a few comments for a great suggestion an explanation by Jack. As for the picture issue you mentioned in another comment - maybe the main picture of this instructable gives you an idea of how the lamp looks from closer up since it's there, just not lit. TIP: Don't score TOO deeply. A scratch is a better control for cracking than a gouge. Another way to have a consistent score at the right height is the place the bottle horizontally on a "cradle" (see below). There's a great instructible on making one of the jigs - useful for other cylindrical applications, too. Below is another kind of jig that's also adjustable for the height of the cut. For glass workers, we used to score the bottle, place on a lazysusan, and torch the score, then place a couple of drops of water on the score, and "POP!" the bottle cracks along the score. Very cool 'ible. I've thought for many years that I should make some cool drinking glasses and such. I have a suggestion for separating the top from the bottom which I learned a long time ago from a (probably) Popular Mechanics magazine. A ring of nichrome wire (like an old toaster heating element) with a power source to match (you would be using a very short piece of nichrome, so you'll probably only need about 12 volts); heat the glass; chill the glass quickly. It will then (hopefully) crack in a perfect circle. 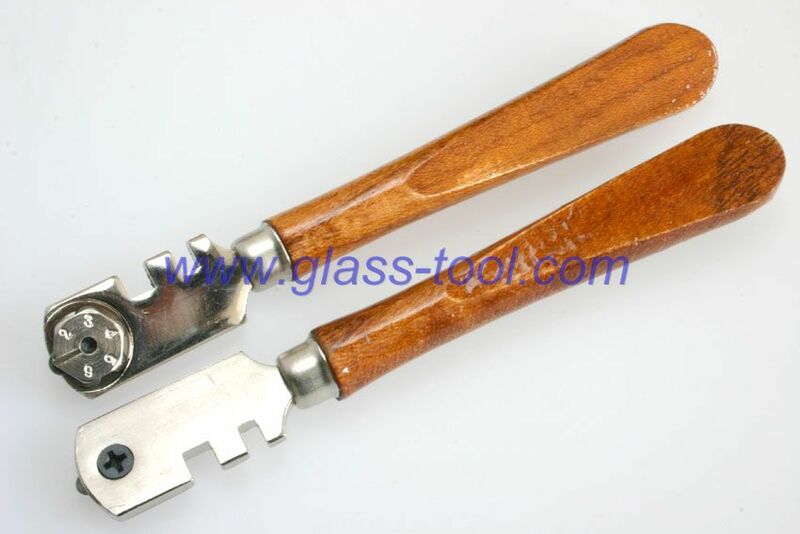 Use a glass cutter ball to finish the cracking process. Then do the usual edge dressing. I have been tempted to try some Nichrome/Kanthal wire trickery for a while, but never really got to it... Thanks for the suggestion! Try fire smoothing of the cut edges. . . Use the torch to slightly melt the glass and let it form into a smooth edge. . .Yes, you may have to finish up with abrasive compound, but it's fun to fire glaze the glass. . . Using the roll jig is very good and is easy to make, also the cutter is fastened to the jig. . . . Nice instr. . . .